This has been a busy little kitchen lately. I have had a fruitful July. These peaches and cream muffins are most definitely a recipe worth passing on. They come from this At Our Table cookbook, which I mentioned buying last year. This is only the second recipe I've tried from this book, but it's a winner. Studded with chunks of fresh peaches and laced with grated orange peel, what puts these over the top is the cube of cream cheese dunked in the middle of each muffin before baking. When warm, the stuff oozes like fine melted chocolate. When cool -- well, nothing more to say other than it's mmmm mmmm good. In medium bowl, combine flour, 3/4 c. sugar, baking powder, and baking soda. Cut in the 6 T. butter with a pastry blender, until mixture is crumbly. In small bowl, mix together the buttermilk, orange juice, orange peel, and egg. Stir the wet ingredients into the dry ingredients until moistened. Add in the peaches. Line 12 muffin cups with cupcake papers. Fill each about 3/4 full with batter, until all is used. Put remaining 1/4 c. sugar in small bowl; dip each little cube of cream cheese in the sugar, then stick it down into the center of the muffin batter in each cup. In small bowl, mix together streusel topping. Plop a small spoonful onto each muffin until all is used. Bake at 400 degrees for 15 - 20 minutes, until muffins turn a little bit golden. NOTE: According to the At Our Table cookbook, you can substitute other fruits for the peaches. I don't know why I love this dish so much. To me, it's comfort food, creamy and full in your mouth, like rice pudding -- only cold. And filled with peaches. And berries. And the crunch of a little walnut. You can eat this Peach Muesli with Berries for breakfast, lunch, or snack. I'm sure I've eaten it for dinner, too, in the same way you sometimes pour yourself a bowl of Cheerios and call it a day. For some reason I make this in no other month than July, when the backyard peach tree gives forth her exquisite magic, one whiff of which tells you there is truly no other place you'd rather be than right here, nose in fruit, inhaling summer. Mmmm. I think it's time to go make another batch. In medium bowl (one that has a lid is perfect), combine oatmeal, peaches, juice, yogurt, and vanilla. Stir together well. If eating immediately, throw some in a bowl and toss on the berries and nuts. If eating later, just put in the fridge, covered, until you're ready to eat. Toss on the nuts and berries before serving. Keeps for several days -- if it lasts that long. NOTE: Recipe comes from the Venice Yacht Club Cookbook of 1998, which was dedicated to the memory of my Aunt Jan, a kind and fun lady. Miss you, Aunt Jan. NOTE #2: If you have lots and lots of peaches, consider making some peach nectar. Perfect for freezing and giving you that mid-winter reminder of summer. transforming the little plum beauties into plum jam, plum-blackberry sauce, canned plums, plum crisp, etc., etc. . . . I was ready for some chocolate. A while back, I had seen these one-bowl brownies on author Ann Kroeker's entertaining blog. Ann's instructions: "Do not modify this recipe to try to make it healthier. Use all the eggs. All the sugar. All the butter. If you've got the chocolate chips, put 'em in." She even promised ecstatic swooning. I am here to tell you, after making these brownies and using all the eggs, all the sugar, all the butter, and yes, even the chocolate chips, when it comes to swooning, Ann does not lie. Here's the link to Ann's brownies, and to her blog, and to her wonderful book Not So Fast that you should really take a look at, if you haven't already. Here's a guest post she did right here on this very blog, featuring a nifty Belgian salad. 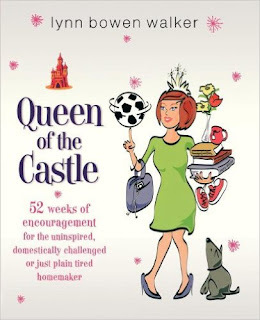 And while I'm linking away, here's a link to Queen of the Castle, which is chock full of homemaking inspiration that includes more than a few equally fantastic chocolate recipes. Now back to the plums. Because we really do have scads of them. peach, nectarine, big plum, little plum, and olallieberry crumble. Because I happen to have a little bit of fruit around here. 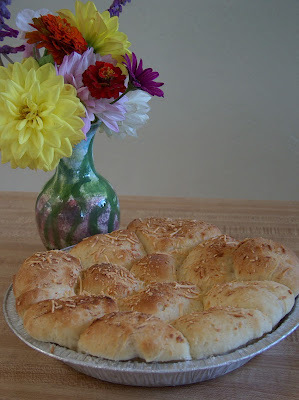 This recipe came from an old issue of Workbasket magazine. Does anyone remember that publication? It was a digest-sized gem that contained homespun recipes and craft ideas. I don't think it's being published any more, and that's a cryin' shame. Here's a little background on Workbasket, for the curious. But back to the recipe. It was originally titled Blueberry Crumble, and contained four cups of frozen blueberries. But I substituted two cups of olallieberries, and two cups of plum/peach/nectarine mixture, chopped. With the little bit of lemon added, plus the crumbly oatmeal topping, this was a winner. Two thumbs up. Or four, if you count Kahuna's. And why wouldn't we count Kahuna's? Now onto the recipe, which you have my permission to make with blueberries, olallieberries, peaches, plums, or all of the above. Place fruit, sugar, and cornstarch in large saucepan. Cook, stirring, over medium heat until fruit gets juicy and mixture thickens. Stir in lemon juice and lemon peel, and pour mixture into 2 qt. baking dish. In small bowl, mix together oatmeal, flour, butter, brown sugar, and cinnamon. You can use a fork, or crumble together with your fingers. (This might be a fun job for little ones.) Once it's well mixed and crumbly, sprinkle it over the fruit. Bake at 375 degrees for 15 - 20 minutes, until top is lightly browned. I got my hands on some plums recently. Half, these large ones, and half the small ones. So I had big fun in the kitchen. This plum jam was just plums and sugar, no added pectin. Note the plastic lids, which means they aren't sealed for shelf storage; they're going straight into the freezer. And then there's the plum sauce. Plums, honey, garlic ginger. Boiled and simmered and pureed in the blender. Quick to make and wonderful over steak, chicken, ribs. Combine in medium saucepan the plums, water, honey, ginger, and garlic. Bring to boil, then lower heat and simmer, covered, for about 5 minutes. Remove from heat and stir in soy sauce. Let cool slightly, then, in small-ish batches, puree in blender until smooth. Pour into containers and enjoy over ribs, chicken, etc. I'll bet it would also be good as a dipping sauce for egg rolls. Watermelon jelly. File this under, "Sounds like a better idea than it actually is." But at least it's pretty.